I just got back from Charleston, SC. It was my second trip to the city and it's quickly becoming one of my favorite destinations. If you've never been, you must go--there's truly something for everyone. If you're a foodie, you'll love the low-country cuisine. If you're a history buff, the city is rich in history and culture. If you're a shopper like me, it's paradise. I shopped and shopped..I shopped until I almost dropped. Up and down King Street, Queen Street, East Bay, and everywhere in between, I discovered so many amazing boutiques. Let me introduce you to a few of my favorites...if I had to list them all this blog would be way too long! Noddy is the cutest little boutique that's jam-packed with unusual pieces for just about everyone. From exotic skin bags by Taxidermy to fabulous stone necklaces and household items, you could spend hours poking around the shop. The jewelry selection was amazing---each piece was so unique! Although Billy Reid is a clothing line with stores across the U.S., the Charleston location felt like a small-town boutique. We chatted it up with the staff--everyone was just delightful! After hanging out with them for over an hour, we felt like we had made new friends. The clothing (men's and women's) is a bit of everything....it's classic, preppy and even a little edgy. It's modern and hip and so well made. It's quality. Love the color of these lace-ups. What I really love about the line is that it cuts across all age brackets. I could see many of the pieces appealing to the 20'something crowd, yet my 77 year old mom bought a Billy Reid dress! I could easily have maxed out my credit card. Everything I looked at, I wanted! 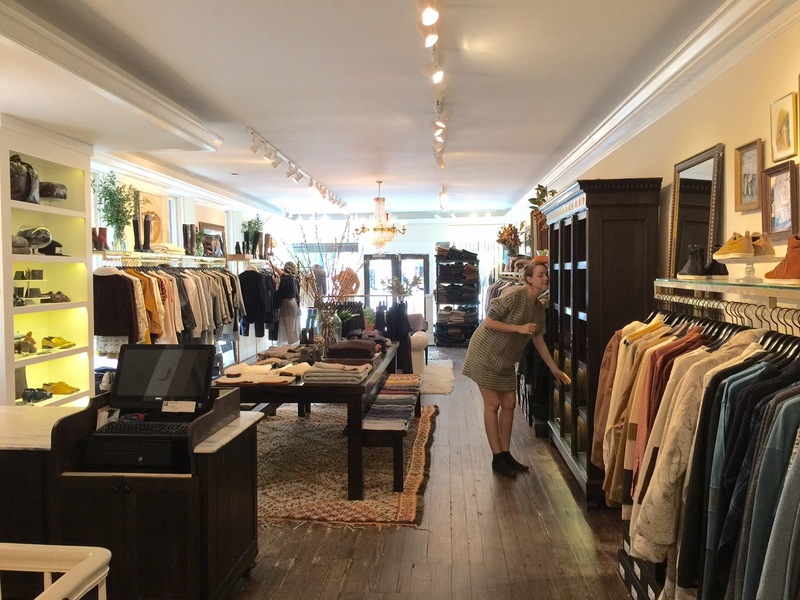 The boutique is absolutely gorgeous and so well laid out. The atmosphere made for relaxed shopping. Say hi to store manager Becca, who is expecting her first baby in January! not to mention I felt kind of "cool in them. Becca encourage me to try on the shoes, but I found the leather vest on my own. It was tough to part ways. I loved spending time at this hidden gem tucked away in the French Quarter Arts District of the city. 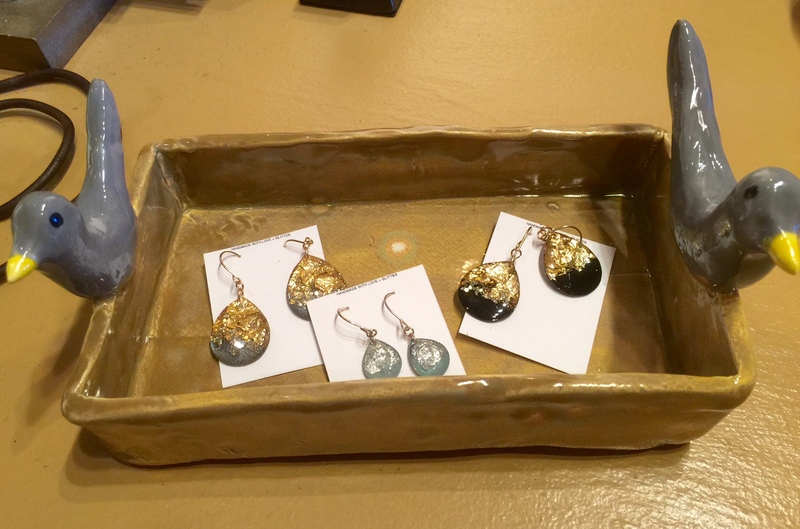 Although the space is very small, the shop is filled to the brim with whimsical and unique ceramics, jewelry, pairings and sculptures. Isn't this the sweetest tray? I found a Christmas gift for my daughter Alyssa, but I can't show it since she reads my blog! 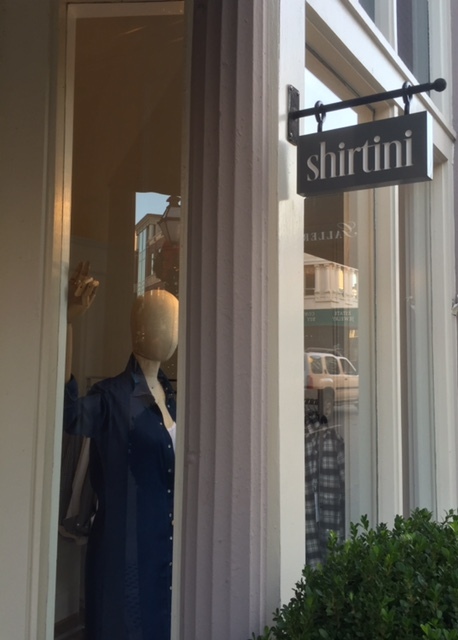 Every woman should have the perfect button down and the place to find it is Shirtini--where there's an entire boutique dedicated to the "shirt". They have flannels, silks, cotton...casual and dressy. They even have a few shirt-dresses and a small but beautiful collection of jewelry and accessories. So you might be wondering what I bought on this Charleston adventure. Because I only took a carry-on and didn't have much suitcase space (dumb move on my part), I had to restrain myself from going crazy. But I did get a few amazing pieces like this Cynthia Rowley leather bag in the most gorgeous shade of blue from the Cynthia Rowley Boutique on King Street. I also bought the blue beads (top right) at Noddy Charleston. And I picked up a few holiday gifts that I can't show (or the cat will be out of the bag!). We ended the trip with Sunday Gospel brunch at the one and only Hall's Chophouse. Gospel music and amazing food (sweet potato pancakes and eggs!) equals heaven! I can't wait to do the Charleston again! Y'all have a wonderful day! Looks like a fun trip! Thanks for taking us along on your shopping tour!